This double CD groups works which have been recorded on August 2011 by Raul Maldonado and Christian de Chabot and others ones , fully restored, which have been engraved by Raul Maldonado between 1970 and 1973. Raul Maldonado happily blend, all along his huge career, classical culture and deep love for Latin American Music. 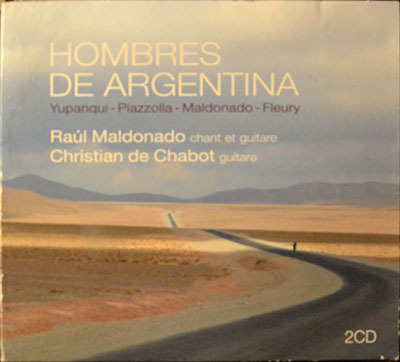 Christian de Chabot is also a guitarist whose art is expressed in all the repertories. Christian de Chabot plays with delicacy and sensivity and let us listen all the colors of his instrument. To this mastered sensivity replies the voice of Raul Maldonado, so warm and full of memory. It is amazing to note how the tone of the voice, so special, remained intact since 1970, this tone which represents according Roland Barthes " the fringe of contact between Music and Language". Overmore, his performances as a soloist remain essential references.